Spring Health Products is a leader in curing light technology, and values itself on being customer friendly as well as cost affordable. 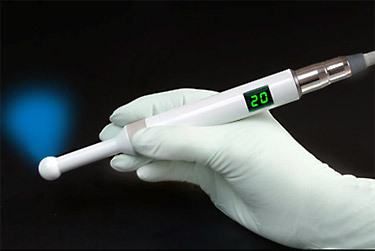 Spring health has updated its proven success of “The Cure” curing light, with The Cure 24V. Features are, a higher low/high of 600/1200 mw for almost instant cures. This light can be conveniently hardwired to any dental unit or be given a power supply for wall plug in. A rubber silicone cord for extra flexibility, will be provided in either option. It also has a digital readout screen for adjustable curing times, but still the same light weight durable wand design. 1 year warranty.but still the same light weight durable wand design.